I was Hit By Someone Driving a Golf Cart. Do I Have a Case? Posted on 05/05/2017 I was Hit By Someone Driving a Golf Cart. Do I Have a Case? Posted on 03/22/2017 Have You Been Injured By a Golf Cart Driven By Another Golfer? A Golfer Ran Into Me with a Cart, Who's Liable? When a golf cart is operated by someone it is considered a dangerous instrumentality much like a car and it should be taken very seriously. We receive a surprising number of calls from people who have been hurt in Florida by someone operating a golf cart. These crashes can happen to a pedestrian, someone on a bicycle or a golfer while on a golf course. Finding insurance to compensate the injured person will be affected by where the crash took place, who owned the cart and who was operating it at the time of the collision. Golf carts, like automobiles, have been declared by Florida courts to be dangerous instrumentalities. This simply means our courts understand they are capable of causing great bodily harm. It also means the owner of a golf cart is strictly liable for its use. The owner is legally responsible whether they were driving or someone else was driving it with the owner's permission. 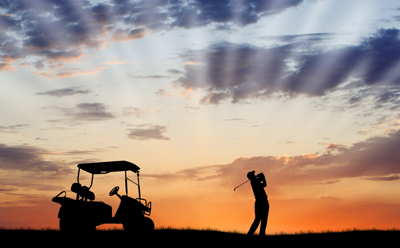 When a golf cart being operated on a golf course runs into another golfer, for instance, the injured golfer can look to two sources for compensation for their injuries. First, if the golf course is the owner of the golf cart it is strictly liable for its use. The golf course would have a general liability policy which should provide liability insurance to compensate the injured golfer. In addition, if the person operating the golf cart is a homeowner, they would be covered by their own homeowners insurance policy. This applies whether the driver owned a home in Florida or was visiting here and owned a home in another state. We just recently settled one of these cases and both the golf course and the homeowner's insurance policy of the person driving the cart contributed towards the settlement amount our client received. A different set of rules come into play when a cyclist or a pedestrian is hit by a golf cart being operated on a street or public road. Probably the most well known designated golf cart community in Florida is The Villages. But, there are many others in which people use golf carts almost exclusively for their transportation. In addition, many Florida cities have designated specific streets or neighborhoods where these vehicles may be lawfully operated. Generally, these carts have been modified so that they are "street legal" with required headlights and other safety features. Street legal golf carts come under the category of a "low speed vehicle" and may be covered under one or more forms of insurance. First, they may be insured by the owner's car insurance policy with an endorsement for this specific type of vehicle. Such a policy would provide liability insurance if the owner or driver hurts a pedestrian or someone riding a bicycle. Second, there are specialty insurance companies which sell specific policies insuring a golf cart and low speed vehicles in Florida. Third, it is possible for the owner or driver to be covered by their homeowners insurance for the operation of one of these vehicles within a designated golf cart community or on designated community streets. Finally, if the cart is not insured under any of these policies it is possible it may be deemed an uninsured vehicle bringing the injured person's Uninsured Motorist coverage into play under their own auto insurance policy. If you or someone you know has been hurt by a golf cart in Florida it's important to talk to a lawyer who understands how to find the right insurance coverage in order to be fully compensated. We routinely represent injured clients throughout Florida and it is never necessary to drive to our offices. We'll come to you. There is never a charge to discuss the circumstances of your case. Just pick up the phone and call us or fill out the contact form on this page. We look forward to hearing from you.